“On May 4, Metro will begin a major capital project which will close the west entrance to Van Ness and install four new entrance escalators, one at the west entrance and three longer units into the station. The project will replace the current escalators, which are almost 35 years old and have exceeded their useful life, with brand new escalators that are more durable and reliable. Metro’s contractor, KONE, will install the new escalators one at a time: completing each of the three longer units from the landing to the mezzanine first then finishing up with replacing the final shorter entrance unit to landing. Two landing to mezzanine escalators along with the elevator and newly replaced east side entrance escalators will remain available for customer use. 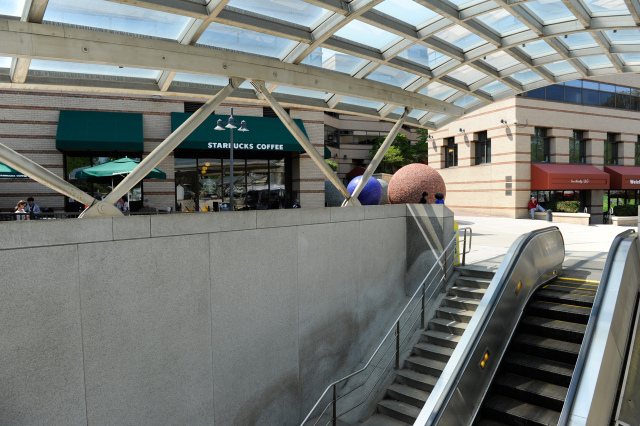 At 270 feet long, the Van Ness escalators transport riders 56 feet from the station mezzanine to the entrance landing. They will be replaced with more reliable units as part of Metro’s contract with KONE to replace 128 escalators across the Metrorail system. Each escalator will require approximately 40 weeks for site preparation, demolition, construction, installation and testing. Replacing all four escalators in succession will take a total of about 3 years. Metro engineers will work closely with the project contractor, KONE, to ensure the work is done as safely and efficiently as possible. The Van Ness escalators are 270 feet long and transport riders 56 feet from the station mezzanine to the entrance landing so their replacement is more complicated than an average escalator replacement. For example, the mid-level landing requires the smaller street to landing unit at the west entrance to be removed prior to the longer middle units and will require considerably more crane activity to remove the structures and major trusses that hold each of the escalators. To keep the station open, the escalators will be replaced one at a time rather than all at once. And for safety reasons, the work can only be conducted when the station is closed to customers and the adjacent escalators are not in service. Taken together, these factors extend the project timeline to about 3 years. However, portions of the new escalators are manufactured in advance and are in storage so the project can move forward efficiently. How will this work affect my trip? Customers need to enter and exit the station on the east side. Instead of having three escalators available from the landing, only two will be available during the project: one going up, and one going down. Metro will have escalator technicians on standby at Van Ness to respond immediately to any outage affecting the two available escalators. However, riders should be aware there that in the event of a service disruption, the station may need to be temporarily closed to prevent safety hazards related to overcrowding. When will Van Ness Station need to be closed? Metro may need to temporarily close the station to prevent overcrowding during service disruptions or other events – such as a disabled train, medical emergency, infrastructure problem or power failure. This may happen with little advance notice. When the station is temporarily closed, Red Line trains will bypass the station in both directions and passengers on the platform will have to exit the station. Review your options now, and create an alternate plan for the possibility that Van Ness Station is not available. The nearest alternate station is Cleveland Park which is 7/10ths of mile to the south (approximately 15 minute walk) on Connecticut Ave. Metrobus is also a good alternative, so you are urged to familiarize yourself now with local bus routes. How will I know if the station is closed? Sign up for MetroAlerts to receive emails or text messages alerting you whenever there is a disruption on the Red Line or closure of the Van Ness. MetroAlerts will send another notification when the station has reopened. You can sign up at wmata.com/metroalerts.